Toddler Time is geared toward our 18 month- 3 year-old friends, but all ages are welcome! We usually read one story, sing songs, and have an activity. Toddler Time meets every Tuesday at 10 am during the school year, and lasts around 45 minutes. Preschool Story Time is geared toward our 3-5 year-old friends, but all ages are welcome! We usually read two stories, sing songs, have an activity, and a craft. Preschool Story Time meets every Thursday at 10 a.m. during the school year, and between 45-60 minutes. 3rd Saturday of the month, drop in times from 10 a.m. – 2 p.m.
Saturdays are busy! 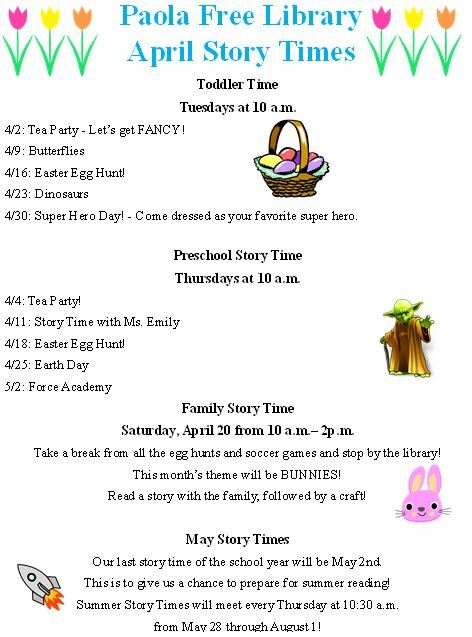 Drop by the Family Reading Room between 10 a.m. and 2 p.m. Books will be available that go with each month’s theme. There will also be a craft or activity available for your family.